This is a story of accountability, in an exemplary and symbolic sense. In this story, context is everything. An elderly man has just been sentenced to 30 years prison (which means an effective 19-year further prison term, as he was in prison awaiting trial for many years already). Why is the sentencing of this one man, who was the head of the Khmer Rouge regime's main interrogation centre in Phnom Penh during its years of power, so important? Comrade Duch was found guilty of all charges against him in the joint Cambodian/United Nations court, set up in Phnom Penh to try Khmer Rouge crimes against humanity. The court's gestation was painfully slow: Duch is the first person to be tried here. Next year, four surviving senior members of the Khmer Rouge political leadership from 1975–79 will go before the court, if they are still alive. Duch was not a member of the top leadership. He was a middle-ranking Khmer Rouge cadre, a former teacher, tasked to administer the S-21 interrogation centre at Toul Sleng, a suburb of Phnom Penh. Here, tens of thousands of Cambodians were imprisoned, interrogated, tortured, and executed at a nearby killing field. All were suspected of being enemies of the Khmer Rouge: many had been previously active in political or military roles before the Khmer Rouge victory in 1975, or were Khmer Rouge cadres themselves who had fallen under the suspicion of an increasingly paranoid and fanatically nationalist regime. The regime was toppled in 1979 by a Vietnamese invasion, which replaced it with a Communist state under Vietnamese protection, the State of Cambodia. Around 1.7 million Cambodians are estimated to have died during the Khmer Rouge regime. Many died of starvation and disease under forced labour conditions, but many others died by mass execution. There were killing fields all over Cambodia, where people were killed on orders from local party cadres. People were clubbed to death or pushed off cliffs, for the most minor breaches or for having bourgeois class backgrounds. S-21 was different. It became the leading interrogation centre for people suspected of political crimes (and their families). Here, the Democratic People's Republic of Kampuchea (DPRK) set about devouring its own people. Hun Sen was a young minor DPRK cadre from the suspect eastern region, who saw the writing on the wall. He fled with comrades to Vietnam; he would have probably died in Toul Sleng otherwise. Following the fall of the regime in 1979, the movement did not die. It was kept alive and well supplied in the Cambodian-Thai borderlands, as a military and political insurgency backed by China, the Western powers and ASEAN, which saw a common interest in humiliating and weakening Soviet-backed Vietnam. With Western support, the DPRK held the Cambodian seat in the UN until the early 1980s, when the seat was declared vacant. The State of Cambodia, now led by Hun Sen, was never granted legitimacy by the UN. It voluntarily surrendered power to a UN-led transitional administration (UNTAC) in 1993, following the UN Cambodia Peace Accords. Hun Sen later re-consolidated his power in 1997, after a failed attempted coup by his royalist co-prime minister and rival, Prince Ranariddh. He remains in firm power today. From the beginning of the UNTAC presence, there were hopes to bring former Khmer Rouge leaders to trial. But deep mutual historical resentments and suspicions between Hun Sen and the UN Legal Division impeded progress towards agreement on matters of the court's structure and process for many years. Eventually, a compromise was reached: a joint Cambodian/UN court, funded internationally and with Cambodian and international judges, and sitting in Cambodia. It was understood that the court would seek to try only a small number of leading Khmer Rouge cadres, starting with Duch. The court's role would be largely symbolic and educational: it would not seek accountability for the many thousands of people who could be brought to trial for crimes committed during the Khmer Rouge regime. Such people are quietly living in villages, their identities known to their neighbours, all over Cambodia. For them, a charitable line has been drawn over their pasts. Was the Duch trial and sentencing selective justice? In a sense, yes. He had the bad luck to be identified by an Irish journalist, while living quietly in a village. He might easily have got away with it, as many others have. But the name of Toul Sleng, like Auschwitz, carries a special symbolic weight. Duch's exemplary trial and sentencing for crimes against humanity, in an internationally recognised court process, is as important for Cambodia as the post-1945 Nuremberg trials were for Germany. This trial was open to be seen, live and on television, all over Cambodia. Cambodians — a majority of whom were born long after the Khmer Rouge regime — heard Duch's classic Nuremberg defence: that he was only following orders, and that he feared for his and his family's life if he did not. They now have seen that the court rejected this defence. This is an important lesson for Cambodians, a people used to accepting without question the legitimacy of state authority: that sometimes, if a state becomes evil, its orders must be resisted. This is not just a lesson for Cambodians. The trial of Duch offers a quiet reminder that national sovereignty is not absolute: it can't excuse atrocities committed by a regime at home and against its own people. The duty to protect human life is indivisible, and cannot be shrugged off for diplomatic convenience or strategic advantage. Tony Kevin was Australia's Ambassador to Cambodia from 1994 to 1997, years when the Khmer Rouge was still an active and dangerous military insurgency, still in control of large areas of Cambodian territory and seeking the overthrow of the Cambodian government. The movement finally collapsed in 1998, after the deaths of leaders Pol Pot and Ta Mok, and after a general amnesty offer brought in the last insurgents. 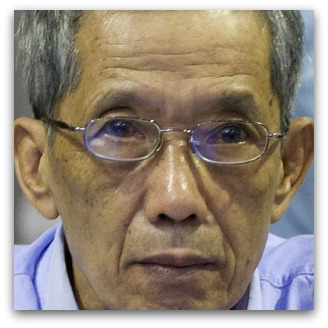 Tony has written several articles on Cambodia's modern history and politics, some of which have appeared in Eureka Street. Thanks for another of Tony Kevin's invaluable pieces. Like the others, this one provides the richness of context that enables the issues involved in Duch's trial to be grasped very satisfyingly. Except of course if they are Israeli's murdering Palestinians and Lebanese, or the US murdering whoever they want when and where they want with impunity. And when was an Australian soldier last charged with murder? It's only yellow and brown people who are charged, except with the exception of Milosevic. The current kind of content-free campaigning, appealing to popular biases and stereotypes, has real consequences for the social services sector and the people they serve. Appearing last week on ABC1's Q+A, Julie Bishop claimed that following a preference deal with the Labor Party, the Greens were now effectively a Labor faction. Preference deals are as old as the preferential system itself. The impact of these deals should not be exaggerated.